Fort IX in Kaunas has played host to two occupying powers. Tsarist Russia constructed the fort as a stronghold used to defend Russia’s border in the West, and the Soviet Union used the fort as a way station to the Gulag. 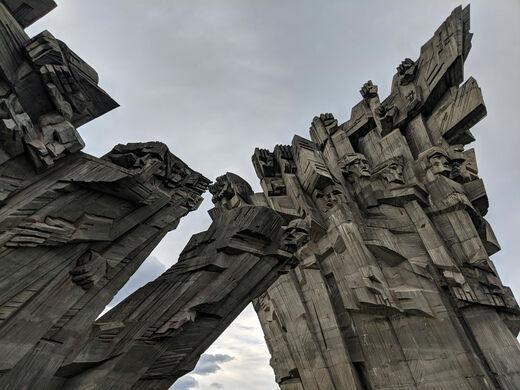 However, the Soviets held the fort for only one year, until the Nazis invaded Lithuania in 1941, sending Soviet troops scattering back to the border. At the turn of the century, Kaunas had a flowering Jewish community. 1/3 of the 75,000 people in the town were Jews and the town was considered a cultural and learning capitol of the Jewish world. Prior to World War II, the Lithuanian Jewish population totaled 220,000, a very significant portion of the population. Unfortunately, the Nazi occupation of Fort IX brought tragedy to the community. 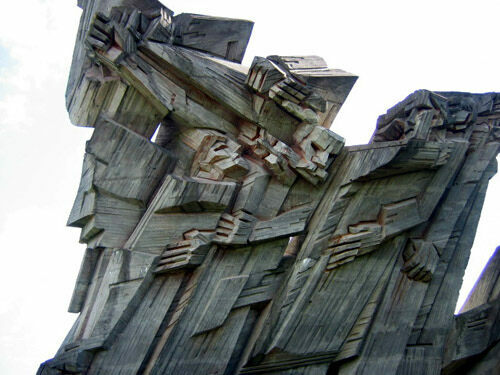 A ghetto was set up in Kaunas, eventually holding 40,000 Jews. During the entire course of the war, only 500 Jews escaped, many joining the army to fight the Nazis in Southern Lithuania. 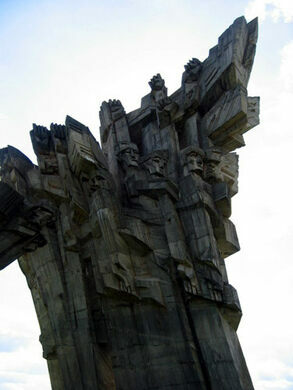 Immediately after its occupation, the fort was used for mass killings of Lithuanian and German Jews. In 1941, the first mass killing of German Jews took place in the forest behind the fort. 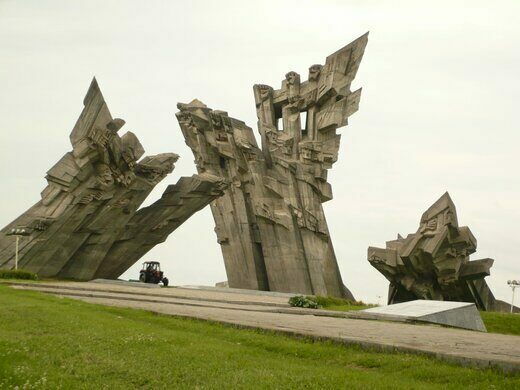 The atrocities continued through the war, and between 35,000-50,000 Jews were murdered at Fort IX in Kaunas. Many were placed in unmarked graves they were forced to dig themselves. 2,000 Jews also perished in the Kaunas ghetto when the Nazis destroyed it with explosives in 1944 as they were losing ground. 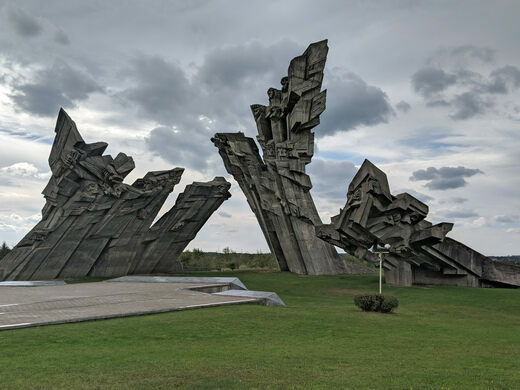 In 1958, a small memorial was placed in the field behind Fort IX to memorialize the horrifying loss of Jewish life in Lithuania and Kaunas. Sadly, it took another 33 years before the current monument was erected. 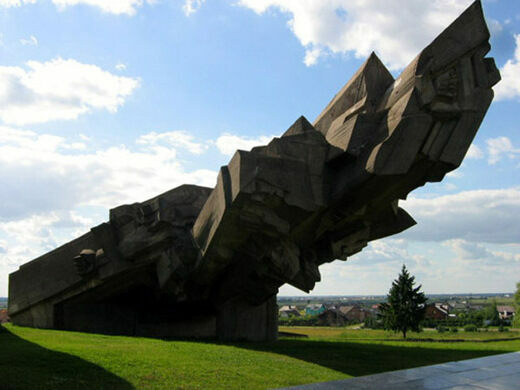 In 1991, the remaining Jewish community of Kaunas unveiled three massive steles designed by Alfonsas Ambraziūnas. The current Jewish population of the entire country of Lithuania stands at 3,200.